Schematic diagram of the human eye. 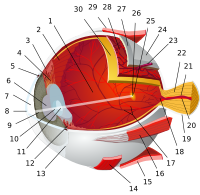 The globe of the eye, or bulbus oculi, is the eyeball apart from its appendages. A hollow structure, the bulbus oculi is composed of a wall enclosing a cavity filled with fluid with three coats: the sclera, choroid, and the retina. Normally, the bulbus oculi is bulb-like structure. However, the bulbus oculi is not completely spherical. Its anterior surface, transparent and more curved, is known as the cornea of the bulbus oculi. ^ "Globe of eye ", Biology Online, 2009-08-20. Retrieved on 2009-08-20. ^ Bailey, Frederick Randolph (1920). Text-book of histology (6 ed.). University of California: W. Wood. ^ TMB. "Wall of the Bulbus Oculi". Tpub.com. Retrieved 2012-11-27. This page was last edited on 1 October 2018, at 18:16 (UTC).